I’ve had this photograph for quite a while and every time I look at it I’m filled with longing. It’s labeled on the back “Fondren Staff Area, 1966.” I don’t have a good mental map of how the library was laid out before I got here in the early ’90s so I’m not really sure where this room was located. I’d guess it to be closer to the front of the building than the back, though. There’s an awful lot of obsolete technology here but the thing I’m interested in today is hard to see. Zoom in and look at the old typewriter to the left of the woman in the brown dress. That’s actually not what I’m talking about, but on the same table you can just make out a couple of small carousels. 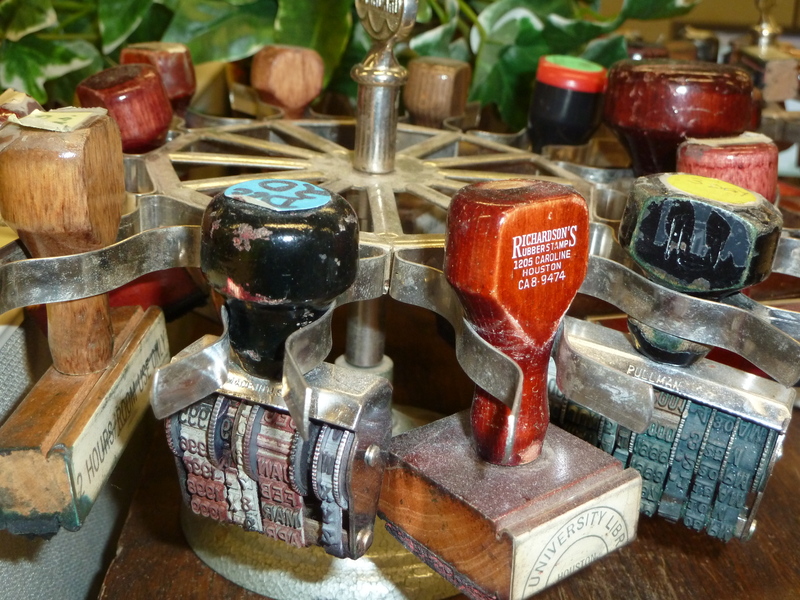 Those carousels held something we don’t use any more: rubber stamps. They’re useless now, of course, but they’re still kind of beautiful. Bonus: Fondren Summer Hours! As I guess is becoming customary, I’ll try to keep posting on a regular basis over the summer but might miss a day or two here or there. I’ve got plans to go out to Berkeley to look at Ken Pitzer’s papers. Tantalizingly, they also have a collection of papers from Griffith C. Evans, Rice’s first mathematics professor, which include both documents and photos from his years here. Not useless…We could have a cool exhibition of obsolete tech…. You faced the circulation desk as soon as you walked in the main (front) doors. I believe the staff area was located behind the wall behind the circ desk which ran north all the way to the Humanities room. The card catalog shared the large room with the circ desk. The staff area was quite a sizable room. I saw it years after that photo as it was being repurposed. (late 80s or so). 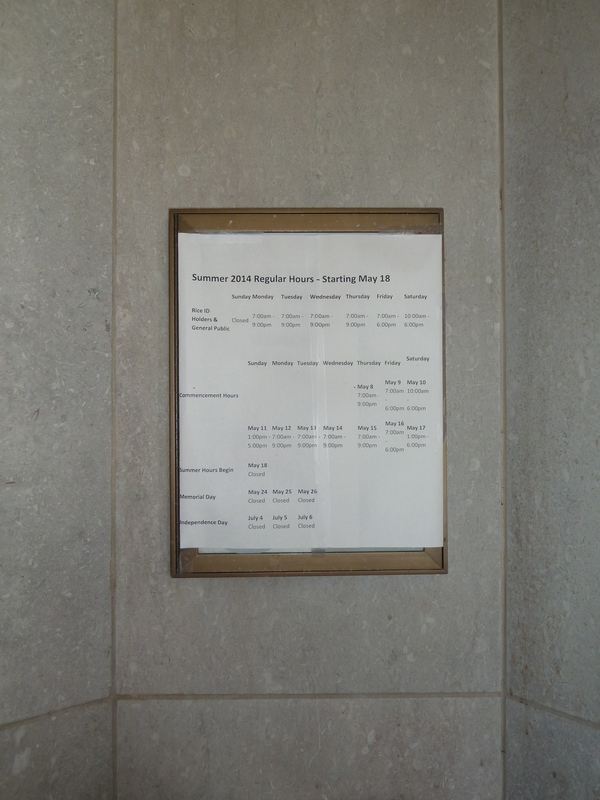 BTW, the Humanities room was sealed off for a while to become the CRPC in the late 80s until Duncan Hall was built. The doorway at the Anderson Hall end of the north wall was cut to allow entry. That space housed Secretary Baker and the foreign ministers during the G-7 Summit in 1990. Sorry Ramsay, by “housed” I meant to refer to what was called the “holding area” for each of the ministers, located in offices of CITI (Fall 1990 Flyleaf, page 7, last paragraph of left column). 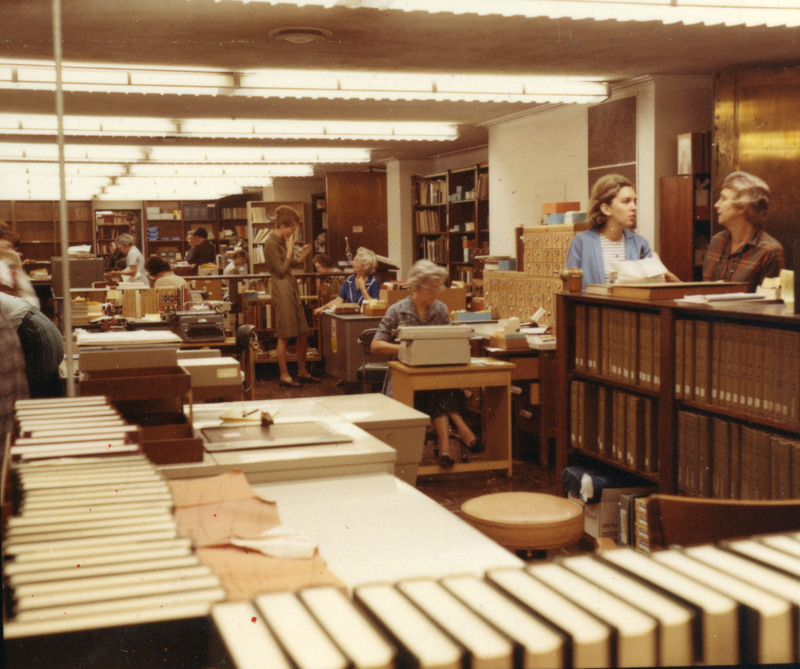 In the late 60’s, the entry to this area from the circ desk/card catalog room was topped by the word “Humanities”. I mistakenly referred to the organization normally occupying the space as CRPC due to its overlapping relationship to CITI. I’ll draw you a floor plan; I remember it well. Where’s Sophie Silversteen when you need her? 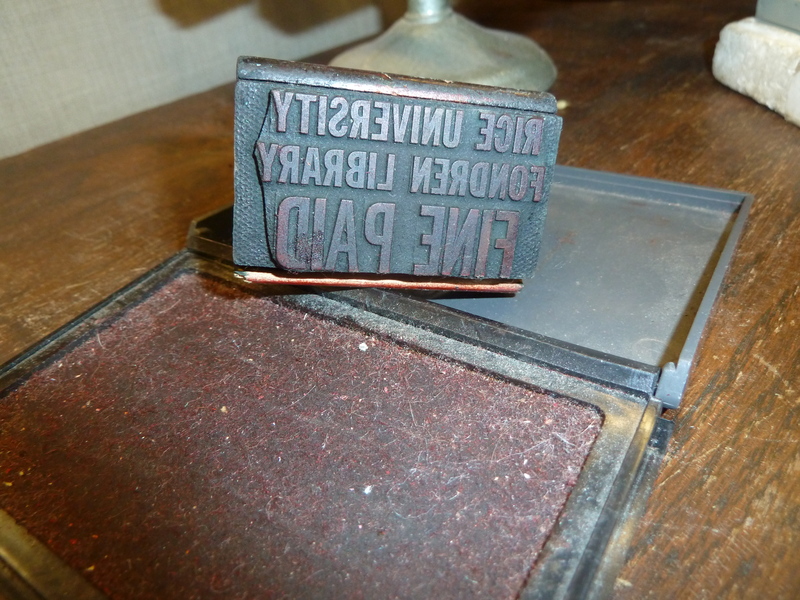 And rubber stamps are not quite useless. I have used them within the last 2 or 3 years and if I were still in the dental office, probably still would. Of course if you really want out of date, whenever I ordain someone to the ministry, or marry people etc., I still use a wax seal which doubles as my episcopal ring. Yes, you’re right. I seem to recall that they still use them occasionally in the Woodson to stamp collection titles on folders. And an episcopal ring—wow! That’s pretty cool. I worked various student jobs at Fondren 1966-68, and used most of the stamps you pictured. The “Reserve” section was just to the left of the main circulation desk, which, as pointed out above, was immediately in front of the main doors I had a great time working there. The staff was uniformly welcoming, friendly (even Jim Mayfield in his own unique way), and of course, literate. I recognize some of the folks in your staff photo! Yes, effegee’s description of the location was correct. The staff work area was really big, but there were a lot of staff and a lot of books and rubbers stamps and typewriters and all kinds of other obsolete tech that had to be housed there. I worked in the Acquisitions Dept. as a student and for a couple of years after graduation (in 1971) as a clerk. Before coming back as a reference librarian after library school for a couple more years. Talk about obsolete tech, I remember having a job in Acquisitions at one point where I needed to type order forms for books that were ordered. You typed 5 copies with carbons in between (pretty nasty if you mis-typed something, which I often did). They needed all those copies because they had to be filed in the card catalog in different locations: title, author, series entry, sometimes other points also. Plus of course copies for the accounting process for the orders. I always had a shift filing, too. Believe me, electronic searching is a LOT better than having to find something obscure in those files! But, we didn’t know then the wonders that the future would hold. Lots of happy memories in that room! Thanks for posting the photo. I worked in the library 1965-66, up until my first child was born, while my husband was in grad school. My job was to catalog doctoral dissertations. Many of the scientific titles might as well have been written in Farsi. I worked at Fondren Library after I graduated from Rice in 1975. It was a wonderful place to be, and I still see one friend whom I met there. We underlings all had to take shifts filing in the card catalog, and then our work was meticulously checked by one of the librarians. My job was in cataloging, so I got to see all the new books. If I felt like reading one for a while, no one seemed to mind. We had a record player and would listen to to newly acquired LPs while we worked. The staff coffee room had a Cezanne water color that belonged to the de Menils. We used to joke about who was going to sneak it out one day. Anybody remember the staff break room that had an old (even then) Coke machine that took nickels, and you put your two or three pennies in an ashtray that sat on top of the machine? Honor system, and those were the best bottled Cokes ever! I don’t remember that one, but I remember the last 10 cent coke machine in Houston being in the Southwestern Bell building downtown. Funny Michael you should mention the listening room. I was thinking about another relic of the past, the language lab. For those of you who are too old nor too young. the language lab consisted of a number of booths equipped with headphones and cassette tapes. You listened to native speakers and then recorded on a second track so you could listen and tell how close you were. I found it most effective, and even today even though my German is not as good as before, I still have a good accent according to Germans I have spoken to. That cannot be said of my Czech, Spanish or Miskito, and I attribute my good German accent to the language lab. I remember occasionally getting to sub for someone who was out in the longest-running friendly bridge game ever…in that break room. The librarians who played must have had hundreds of pages of running scores, must have been playing for years! That’s the best thing I’ve heard all week. Thanks so much for commenting! I remember another room in Fondren with technology which certainly must be obsolete. It was the listening room. I had required listening on tape for my French classes and also for my history of music class. I worked there in the summer of 1984 (for R.I.C.E.—does it still exist?). The room looks much as it did then, with different hairstyles, of course. It was a great place to work. Our job was finding and copying articles, mostly in engineering, for paying commercial clients. I took a certain pleasure in tracking down those that were hard to find. It was a very happy summer.